Thick, creamy and protein-packed, you are going to love this naturally sweetened Chocolate Strawberry Protein Smoothie! Strawberry season is fleeting, lasting just several weeks, which is why we tend to go crazy buying, eating and freezing as many as possible. Whether you’re looking to freeze strawberries, blueberries, corn or any other fruits & veggies, don’t miss my step-by-step guide to freezing summer produce. This year we bought several big flats of berries from Krupp Farms just 15 miles down the street. When I went to pick out a flat they asked what I planned to do with the strawberries. Umm… eat them? By the fistful? Of course, I soon realized he was asking if I planned to add a bunch of sugar and turn them into jam or shortcake topping but no – I can’t imagine the need for adding sugar to these sweet little jewels. Instead, I turned them into a protein-packed chocolate smoothie that is 100% naturally sweetened. Made with creamy yogurt, cocoa powder and a pinch of cinnamon, this Chocolate Strawberry Protein Smoothie is one of my favorite ways to start the day any time of the year. Lucky for me, my freezer is now filled with local Michigan strawberries to make sure that happens. Place all ingredients in a high speed blender and puree until smooth and creamy. Add more ice until you've reached desired level of thickness. Want more smoothies? Check out my Smoothies board! Follow The Lemon Bowl | Liz Della Croce’s board Smoothies on Pinterest. I am in ALL THE STRAWBERRIES ALL THE TIME MODE…love this to sneak them into breakfast or a post workout snack! hahah YOU AND ME BOTH!! 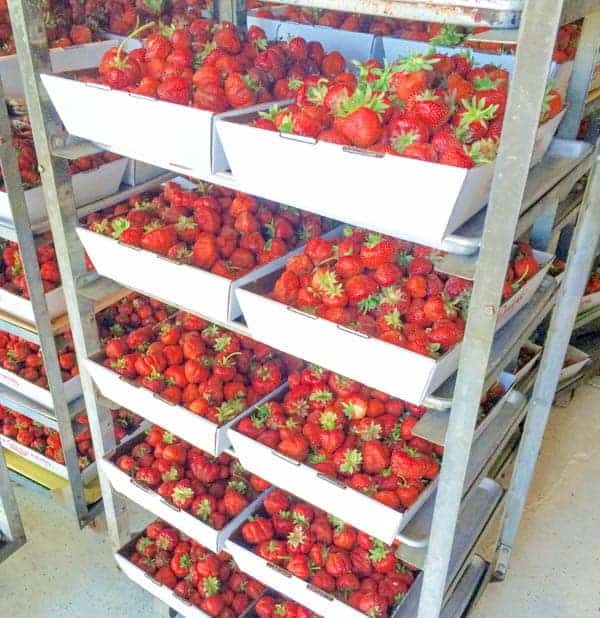 Now that’s a lot of strawberries! It’s far too easy to eat them since they’re so sweet and delicious, so I’m sure you didn’t have a problem. I really need to start canning! And this smoothie sounds like such a creamy, satisfying breakfast or snack! My mom makes jam and I need to get some from her!! Yes exactly!! It’s like a guilt-free sweet treat that happens to be cold, perfect for summer! Oh yummy!! Sounds really good!! Love that you didn’t do something extra sugary with the strawberries!! It always feels wrong messing with perfectly ripe and sweet fruit. 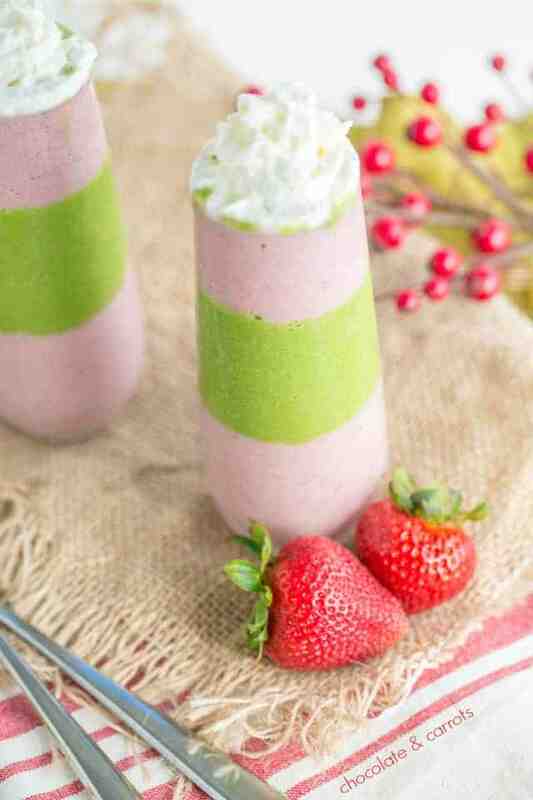 This smoothie sounds perfect and I’m sure the strawberries sweeten it just right. Also, thanks for the protein recommendation, I never know where to start with that stuff. Thank you so much for hosting us again my dear! Sounds yummy! Looking forward to making this. I am sorry to report that we didn’t love this. I think there were just too many flavors in there, and the strawberry flavor did not come through at all. Actually, no particular flavor came through. To me, it was a weird, unrecognizable flavor. I would in the future leave out the banana and cinnamon, and probably the vanilla, so that what I taste is strawberries and chocolate. So sorry you didn’t like it Susan!! We eat this quite a bit and my boys love it but everyone has their own taste! Also, the sweetness of your berries makes a huge difference. Were you using locally picked berries that were ripe? The berries were definitely ripe and tasty, but they were definitely not local – they were Driscoll’s, which I picked up at the grocery store. They actually tasted as good as they looked. My banana was not over-ripe, either. Not only is everyone’s taste different, but I’ve noticed that a lot of things taste better since I got off a couple of meds. I’ll chalk this up to my taste buds. 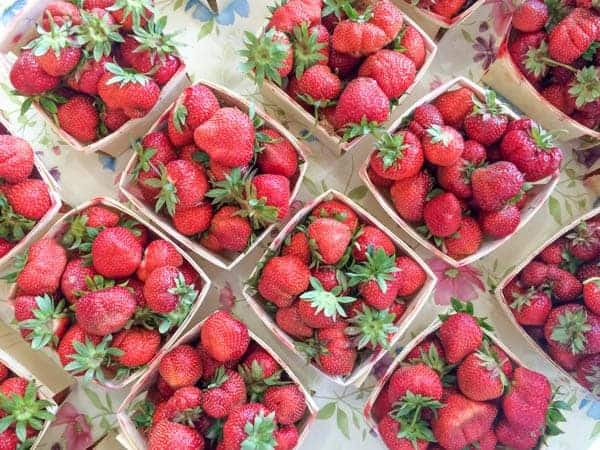 Local strawberries are just THE BEST! I can’t get enough. Love this smoothie and that hint of cinnamon you added. Sounds delicious! We have been eating them like candy!! Isn’t this the best time of year?!? I wish we could sip one together! I hope you love this version!! Cocoa powder really hits the spot in the morning. And dude!! You MUST check out Bob’s protein powder!!! It’s unsweetened!!! I’m laughing because my response to “what are you going to do with all those strawberries” would be the same! We pick a ton when they are in season here (December-February lol) and we just end up eating them “Straight Up”! This smoothie sounds so good, I’m all over it! LOL!! I mean seriously what did he think I was going to do with them? LOL!! Strawberry season is my most favorite season of the year! 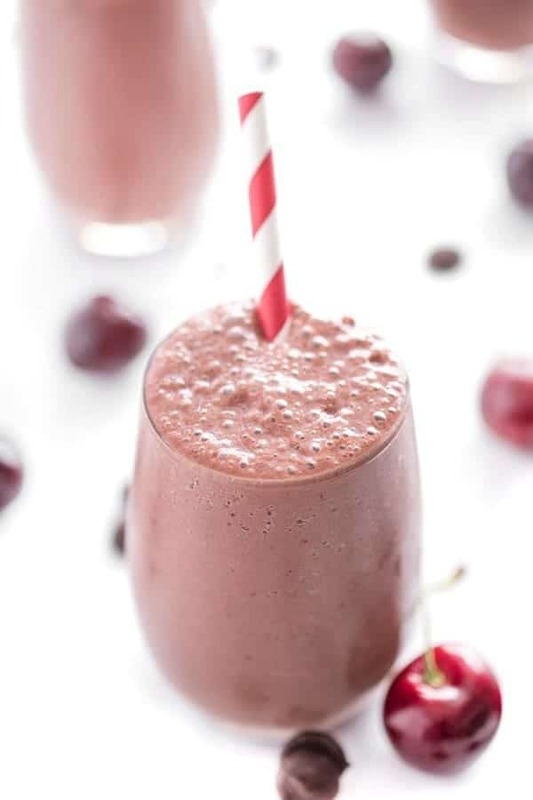 And this chocolate and strawberry protein smoothie is sounding like my new breakfast…for the rest of the whole week! Pinned!